lord John Grey – My Outlander Blog! Season three of Outlander on Starz will introduce some of the book series most popular and beloved characters. Fans are excited to see John Bell play Jamie’s nephew Young Ian and Australian actor David Berry will be filling Lord John Grey’s fashionable shoes! I have to wonder if David had any real idea that he was about to play a character who was so interesting he inspired Diana Gabaldon to write a spin-off series of books . Because Diana is all about tweaking expectations, Lord John’s character is a unique individual who challenges our notions of what it means to be a man. Diana has always described LJG as small and hard bodied with delicate features that include lips and eyelashes that would make any woman jealous. I can see David Berry’s features fitting the bill, but I don’t believe he is as physically small as the character is described in the books. However, if I’ve learned anything from watching the show for the last two years, it’s that physically fitting the part isn’t as important as embodying the spirit of a character. Caitriona Balfe certainly didn’t fit the exact description of Claire in the book, but it is now tough for me to picture the Claire I had in my head because Cait has done such a great job of portraying the important parts of Claire’s personality. The scene at the trial where she won’t bear false witness and her coming to terms with the loss of Faith come to mind. 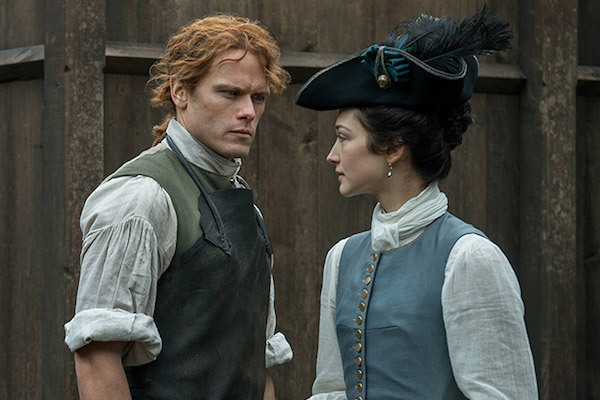 Both moments represented things I much admired in Claire; her integrity, her ability to be pragmatic, and her honesty and they were portrayed to perfection. Sam, Tobias, Grant, Graham, and many of the other actors were not exactly like the characters I had pictured in my head, but it hardly seems to matter now because for me the show has earned a separate, but interrelated identity. I will still always have the books and that Jamie, Claire, and BJR and now, I also have the Jamie, Claire and BJR of the show. As one of my readers put it, “I have a double helping of Outlander”. I have found myself looking forward to seeing how things will be the same and different and whether I will like it or not. Mostly, I’ve liked it and learned to appreciate the storytelling and the acting. In some ways, I am sorry that they will not be able to use size as a part of John’s story. Diana used his smaller stature to bust stereotypes. He is small, but authoritative, beautiful, yet masculine, and the aggressor in most of his relationships. He understands duty and while unashamed of his sexual preference, he is aware that if he is “found out” it would ruin the lives of those he loves and protects. Please remember that it wasn’t that long ago that homosexuality was considered a disease. Coming out in any time period isn’t an easy thing to do, let alone the 1700’s. Diana shows us how one gay man lived as honestly as he could while unable to show the world who is really was, heartbreaking and inspiring. I loved this response of Diana’s to a reader on Twitter who expressed concern over changes from the book to the TV series. As Diana so eloquently stated, the show and books reflect the same truths. Storytelling is a lens through which we see it. It’s something Diana does well. One of the reasons her novels have to come to mean so much to me is the truths I find revealed between those pages. The show is telling their version of her story of truths. They are telling us a story about what it means to be human, to persevere, make difficult choices and having to live with the consequences, to suffer loss, and to love…in all of it’s different shades of being. So, I’ve been thinking of Lord John Grey and what truths the show and David Berry will get a chance to show us. Tom and Lorenzo, TV critics once wrote about Outlander and their feelings about the character Black Jack Randall. Diana has gone on record saying that Black Jack is not gay. She calls him an equal-opportunity sadist. But, I know a lot of viewers like Tom and Lorenzo believe that he is gay. I wrote an article about Tom and Lorenzo’s review and I remember saying I wanted to write to tell them one of the most beloved characters in the series was a gay man. I knew that the information based on my knowledge of the books wouldn’t really be appreciated or help them review the show as presented, but I so wanted to defend Ms. Gabaldon’s representation of gay men. Diana’s characters are so layered and well developed, I have often said that it is possible to talk about and analyze them as if they were real people. John Grey’s story is a compelling look at what life might have been like for a homosexual in the 1700’s when it was illegal to be gay. In Lord John, Diana has created a man who rivals Jamie in integrity and that is saying quite a lot. And, …he is as different from BJR as you could get! Viewer’s of Outlander on Starz met Lord John Grey as a sixteen year old who snuck into the Jacobite’s camp and tried to slit the notorious highlander “Red Jamie’s” throat. He was prepared to die rather than give information, but relented when he thought a woman’s (Clever Claire) honor was in jeopardy. Jamie spared the young Lord’s life and so, the young soldier acknowledged the debt of honor with a promise to kill Jamie once the debt was met. Raised to believe that a man’s word is his bond and his actions a reflection of his worth, Lord John is a man that lives his life by a code of decency and honor. Ron Moore and company will get the chance to expand on the theme of unrequited love. I say expand because they have let us see the relationship between Frank and Claire. I have always maintained that Frank’s biggest sin is simply that he wasn’t Jamie. Through no fault of his own, (Claire always said that she loved him and tried hard to get back to him) Frank is unable to regain what he once had with Claire. There is nothing he can do to regain her love. Her heart is irrevocably Jamie’s and he isn’t Jamie. "Do you know," he said again, softly, addressing his hands, "what it is to love someone, and never- never!-be able to give them peace, or joy, or happiness." He looked up then, eyes filled with pain. "To know that you cannot give them happiness, not through any fault of yours or theirs, but only because you were not born the right person for them?" Lord John has had the misfortune to fall in love with a man who can never return his feelings. Jamie has very real reasons for associating homosexuality with the abuse he suffered at the hands of BJR and could not, in my opinion and Claire’s and Bree’s , have a relationship with a man. But, perhaps the greatest impediment for John is not his gender, but the fact that he just isn’t Claire. Jamie’s heart is irrevocably Claire’s and John isn’t Claire. One of the most wonderful truths Diana’s Lord John teaches us is that love is a gift to be honored even if it is never returned in kind. Lord John makes a conscious choice to love Jamie because to not love him would leave a hole in his soul. "I hated him for as long as I could. But then I realized that loving him...that was part of me, and one of the best parts. It didn't matter that he couldn't love me, that had nothing to do with it. But if I could not forgive him, then I could not love him, and that part of me was gone. And I found eventually that I wanted it back." One of the most character revealing conversations between the two men was over Jamie’s young son William. John had rightfully guessed William’s true parentage and came to Helwater to tell Jamie he would be marrying William’s Aunt Isobel. This will essentially make him the “orphaned” William’s step-father. Jamie tells Claire that he tested LJG’s motives by offering him his body in exchange for John taking good care of William. He assures her if Lord John had failed that test he would have cut his throat right there and then. Grey got to his feet, dusting the seat of his breeches. “I shall probably want you to the day I die,” he said matter-of-factly. “But tempted as I am—” He shook his head, brushing wet grass from his hands. "He loved me, he said. And if I couldn't give him that in return-and he kent I couldn't-then he'd not take counterfeit for true coin." He shook himself, hard, like a dog coming out of the water. I can remember reading that scene and wishing my high school kids could understand what Lord John understood. You truly don’t want someone who doesn’t want you. Don’t settle. Don’t take counterfeit for true coin. The fact that they eventually become friends speaks volumes about both men. I can’t help but believe that Lord John’s friendship became the most important of Jamie’s life. On some level, it is not surprising that they would become friends. Had they met under different circumstances, they would have found they had a lot in common. John and Jamie are both learned men who share a love of books and philosophy. They are both soldiers who have had the responsibility of leadership. They get each other’s sense of humor. They are both fiercely loyal and protective of those they love. And, I think as men of integrity, that they recognize the honor in the other. John challenged Jamie’s beliefs about love and friendship and made him a more tolerant man and Jamie gave John a purpose of sorts and someone worthy to love. "I have never spoken to your father regarding Geneva, Ellesmere, or William himself--save to inform him of my marriage to Isobel and to assure him that I would fulfill my responsibilities as William's guardian to the best of my ability." She set her foot on the stone, driving it into the soft sand, and stopped. "You never said anything to him? What did he say to you?" she demanded. "Nothing." He returned her stare. I believe Brianna’s response was…”men”. John loves Jamie and cares about those Jamie loves because that is what you do when you love someone. Before you say this was unfair to John’s wife Isobel, remember this was a time of arranged marriages. Why not John? He cared about Isobel and William. I could think of far worse situations and men for her to be married off to. Can you say Ellesmere? I have always felt sorry that this wonderful man never found the love he deserved, but Diana isn’t done writing his story yet and I’m hopeful for him. So complicated and yet, to choose to love makes everything simple. I’m sure there are many more truths to be found in Lord John Grey’s story. These are just two that meant a lot to me and I can’t wait to see how David Berry and the show choose to reflect them. And, I hope Tom and Lorenzo watch to see the honorable and beloved Lord John Grey.